Gateway to your career: A creative and versatile apprenticeship focused on freshness. Become a system catering professional. System catering differs from traditional catering since the transitions between kitchen, restaurant, and administration are fluid. System catering is a combination of all these aspects. In addition to interacting with guests and working in the kitchen, system catering professionals have a flair for commercial activities. Their multifaceted talents are what sets our professionals apart from traditional caterers. 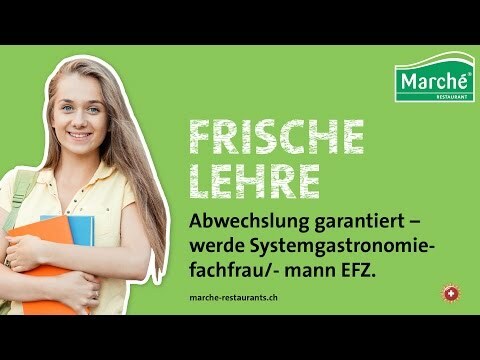 What does the apprenticeship at Marché Restaurants Switzerland AG involve? You act as host, welcome and serve guests, and offer knowledgeable advice. You are familiar with the structure of the company and organize procedures, schedule staff members, and manage shifts. You are responsible for the purchase of ingredients, accepting deliveries, and checking their quality. You then prepare and create dishes from these ingredients to present and sell to your guests. You do your utmost to ensure that operational objectives are met by implementing marketing activities, participating in promotions, and mastering overall operations. You adhere to the principles of hygiene as well as occupational health and safety regulations. The apprenticeship lays the foundation for you to completely take responsibility as a manager at one of our restaurants. Professionals have many further training opportunities in the catering industry, such as completion of the higher professional school (hotel school), higher technical examination, etc. In addition, our internal development program provides support in your career planning. Feel free to get a taste. Are you interested in getting a taste of the many different responsibilities of a system catering professional? Contact us via e-mail.